Japanese food remains a bit of an enigma to me. I love it, don’t get me wrong but having had limited exposure to Japanese restaurants, other than the few westernised versions scatted here and there around the North East, I don’t understand it. I Google/Binged it of course and there are a number of helpful websites out there demonstrating how Japanese ordinarily eat meals, nicely preceded by a simple and typically efficient “itadakimasu”. The trouble is I have to try and translate this to the local restaurants. There’s a good one I like in Newcastle called Osaka: friendly service, informal atmosphere, plenty of Japanese diners (my favourite yardstick for ethnic restaurants). The menu however, is a bit of a dichotomy; on the one hand I love the variety, but on another, it confuses the life out of me. Now I must point out at this stage, that this is far from the biggest problem life can throw at a person, but then this is a food blog. ‘Order-panic’, when the waitress comes over for the second time, is up there with wanting to use the salt and noticing someone seated after you had their order taken first. Major dining issues. This is something I made a little while back with moderately tangible Japanese origins. It’s healthy though (or so I believe this week – see my last piece) and tasty. 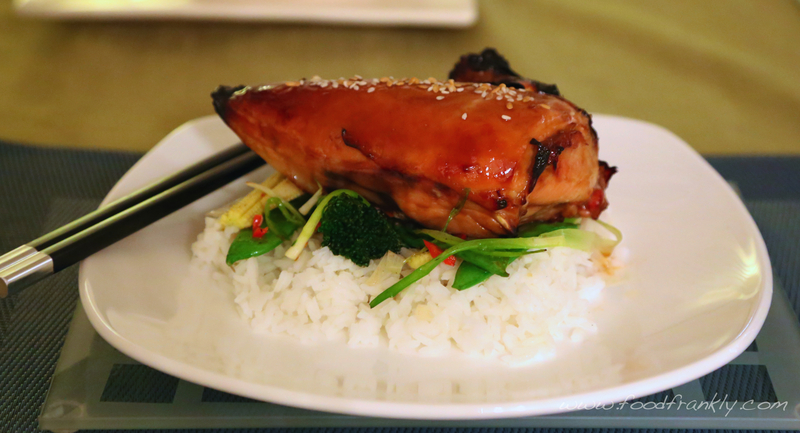 Chicken thigh would have been better as I find no matter how long I marinate chicken breast, it struggles to take on flavour, but the glaze is intensely flavoured. I use a plastic food bag as you can push most the air out and well cover the chicken, rather than have the marinade pooling in the bottom of a container. You can get away with making much less marinade too that way. I cooked the vegetables on a stupidly high heat for only a minute with a small amount of soy and sesame oil and were nicely smoked as a result. And, yes I’m aware the chicken is not getting eaten with those chopsticks. 2 Chicken supremes, skin on or off, I removed it later anyway. Mixed vegetables, I used: thinly sliced spring onion, sugar snap/snow peas, baby corn, red chilli, garlic and small broccoli heads. A little soy and a few drops of sesame oil to flavour. 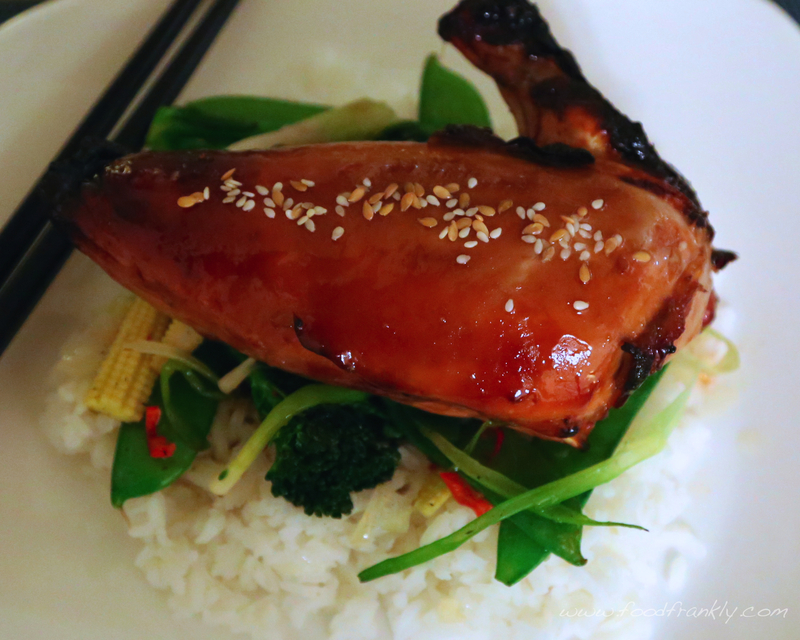 Marinate the chicken in the teriyaki marinade for a day, or two (preferably two as I did here). Boil the pain rice for about 15 minutes, using the absorption method. 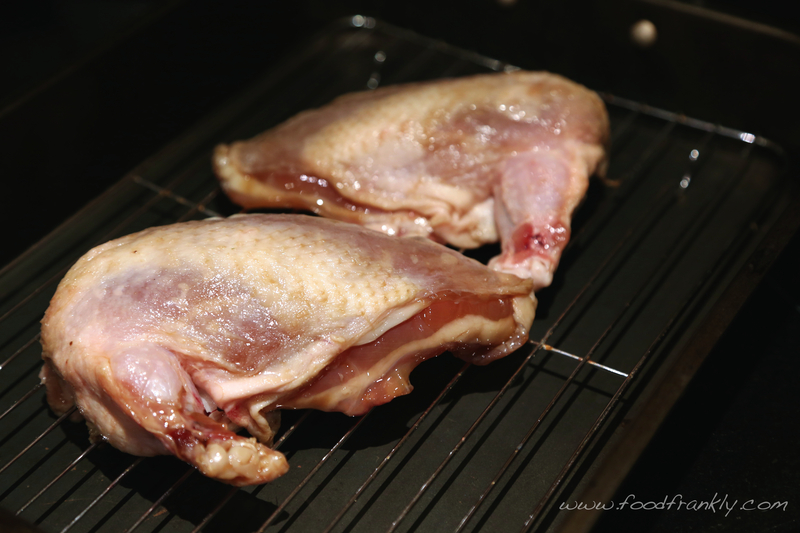 Remove any skin, as it will just shrivel up, and roast in the oven on a wire rack/tray. Brush with the marinade frequently to get a nice glaze. The chicken will be done once at 60-65°C/140-150°F in the centre. Check using a thermometer probe, but it will be about 15-20 minutes depending on the size of the chicken. Sprinkle the seeds over the chicken and leave to rest. Make the vegetables: stir fry them in smoking hot oil for just a minute or two, flavouring with the soy and sesame oil at the end. Serve it all up. Itadakimasu.